Mr. Wright was struck with an iron bar during an attack at the iron ore processing plant when seven inmates escaped from the prison. Mr. Craft was escorting five inmates to work in the mess hall when he was overpowered and strangled during an escape from the the prison. Mr. McKelvey entered a cell to handcuff an inmate for a disciplinary infraction when he was fatally stabbed in the heart with a knife. Mr. Benedict was supervising seventeen inmates in the cloth shop when he was struck with an iron bar and then shot with his service revolver. Miss Wicks had been employed at the hospital for the criminal insane one year when she was stabbed by an inmate. She had planned to leave the hospital in four days to enroll in nursing school. [The brochure concluded with the following appreciations:] Today's ceremony would not have been possible except for the dedication and work of a number of Correctional Services' employees. That list begins with Commissioner Goord, who last year appointed a Memorial Committee and charged them with coordinating this task. It was the dedication and hard work of the Department's Division of Facilities Planning, the Albany Training Academy staff and the Division of Industries who brought the project itself to fruition, by designing and building the park and the memorial room within the academy itself. Special mention must go to Program Research Specialist James A. Lyons. Often on his own time, weekends and vacations, he traveled the state researching the names and events being honored today. It was often as the result of his research that we learned the names and addresses of the survivors present at the dedication. Project Staff: Terry Caffery, John Coogan, Cedric Coulman, Roxann Creen, Thomas Czaban, Paul Havranek, Ken Heady, Burt Heldron, Frank Kurta, Guy Monfett, Dale Rabideau, Richard Rush, David Ryder, George Senor Frank Sheridan, Grace Shillinglaw, Thomas Torpey, Harry Vincent, Peter G. Zubikowski. Memorial Committee: James B. Flateau, Robert Kirkpatrick, Lucien J. Leclaire, John Maloy, Herbert McLaughlin, Joseph Ostrowidski, John R. Patterson, Keith Rupert, Thomas Testo. Mr. McCarthy was shot to death by an escaping inmate who was awaiting execution. The inmate was recaptured and executed eight days later. Dr. North, Superintendent for 13 years at the hospital for insane criminals, had finished speaking with an inmate about making toys when the inmate stabbed him in the back with a chisel. Mr. Gunter was assigned to the prison tuberculosis hospital when he was struck on the head during an attempted escape by two inmates. Mr. Christian was a guard at an institution, later known as Eastern Correctional Facility, when he was struck on the head during a mess hall riot. Mr. Durnin was attacked and fatally stabbed by an inmate with an improvised knife as he stood outside the mess hall door. Armed rioting inmates had taken the prison's warden hostage in a escape plot. Mr. Durnford confronted the rioters and was shot. Mr. Beckwith was in the mess hall with 900 inmates when he was suddenly attacked and stabbed seven times by an inmate. Prison guards attempted to search an inmate when he attacked them with a knife. Mr. Nickerson tried to help his fellow officers and was fatally stabbed. Mr. Donovan was kitchen keeper when he was assaulted by an inmate who struck him on the head with an eight pound iron handle from a machine. 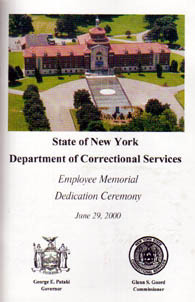 I want to welcome each and every one of you today to our dedication of a memorial to those employees of the Department of Correctional Services who have given their lives in the line of duty to the people of New York State. I want to express my respect for and my admiration of them to the survivors of the 32 employees who we are honoring today. Those heroes will stand with us forever, remembered in the outdoor memorial and in the memorial room of the Training Academy. Their names, and those of the other heroes that we honor today and the awful tragedies that took their lives are still painfully etched in our minds. Still, thousands of prison employees walk a thin line every day to protect us from harm. Sometimes, sadly, that dedication to public safety demands the ultimate sacrifice. On this solemn day, let us say a special prayer for the survivors joining us today, and for all of the family members who have a loved one on the memorial wall in the academy. They, too, have paid the ultimate sacrifice and we are forever in their debt. Let us also pray for the officers and civilian employees here today, and the men and women who are staffing our 70 facilities around the state at this very moment. We must never take them for granted, or fail to appreciate the burden they bear. Let us pray that they never have to make the sacrifices that we honor today. Today's ceremony is but a first step in honoring our heroes. As we document the sacrifice of other deceased employees, their names will be enshrined on the memorial wall in the academy. We will renew our remembrance of those we honor today in an annual observance. Governor Pataki has offered to proclaim the annual week of the Employee Olympics here in Albany as Correctional Employees Week. That is when we award the Department's medals of honor and merit. That ceremony I will be held here, in conjunction with a remembrance of our fallen heroes. As we have for 28 years, we will continue our annual observance at Attica. We will likewise continue our annual observance at Green Haven in the memory of Correction Officer Donna Payant, who we also honor here today. We must be mindful of our past to protect us in the future. We must never forget that the work performed by all our facility staff is the toughest assignment we ask of any state employees. Your entire work day, civilian or uniformed, is spent with the violent felons and repeat predators that our courts and juries want off our streets. Behind the walls of Elmira or Great Meadow, and within the fences at Cape Vincent and Ulster, we can never forget the danger that accompanies our jobs. We must remember their bravery and the fact that they offered up the greatest sacrifice in the performance of their duties. Three long-term inmates, armed with smuggled revolvers, shot Mr. Hartye during an early morning escape from the prison hospital. Mr. Cunningham died while held hostage by inmates during a prison riot. Mr. D'Arcangelo died while held hostage by inmates during a prison riot. Mr. Hardie died while held hostage by inmates during a prison riot. Mr. Jones died while held hostage by inmates during a prison riot. Mr. Lewis died while held hostage by inmates during a prison riot. Mr. Monteleone died while held hostage by inmates during a prison riot. 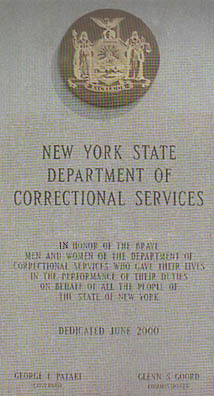 Mr. Quinn was struck on the head and killed by inmates during the first day of the Attica riot. Mr. Valone died while held hostage by inmates during a prison riot. Mr. Werner died while held hostage by inmates during a prison riot. 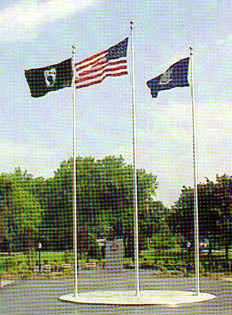 Brochure included memorial park photo. Mr. Whalen died from injuries he sustained while held hostage by inmates during a prison riot. Mr. Sutherland, a parole officer with the Division of Parole and Department of Correctional Services, was shot while apprehending a parolee. Mrs. Vial had been employed less than one year when she was killed by an inmate in the food service area. Mrs. Payant was killed by an inmate less than one month after becoming a correction officer. Mr. Cromie was escorting a disruptive inmate from the dayroom of a housing unit when he was assaulted and suffered a fatal heart attack. Assigned to a hospital ward to guard inmates with drug-resistant tuberculosis, Mr. Petrosino also contracted the disease and died. Mr. Mydlarz had assisted in subduing and escorting an inmate, following an inmate assault on staff incident in the mess hall, when he suffered a fatal heart attack.